Summer’s grip is relaxing as cooler nights and cloudy skies intrude, still I suspect that it will not let go easily. Can you feel the planet approaching the tip of its elliptical path? Birds at my feeder are more insistent. Cicadas are silent. Seed pods are drooping. I like to eat things that recall summer’s carefree and long hours of light accompanied by undertones that celebrate the coming chill and dark of Fall. Here are two of my favorites. 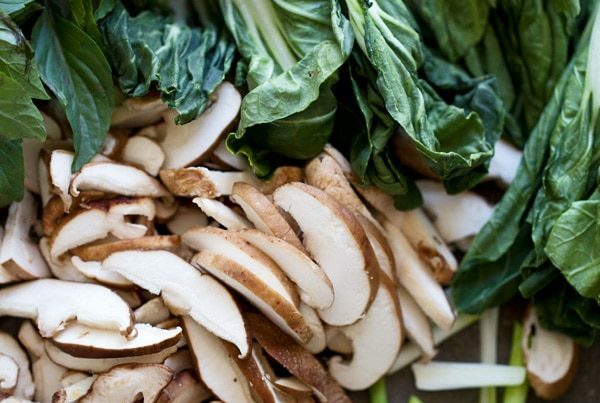 After apples, what says Summer/Fall better than bitter greens? The first recipe is a combination of frisée, fried egg, asparagus, and anchovy. The garlicky, anchovy‑spiced dressing hints of the smell of mushrooms, and elevates this recipe above others. It’s pungent but not showy. Light on the stomach and purse. I substitute green beans or sometimes sliced fennel for the asparagus. I know that others use arugula or even romaine instead of the frisée, but growers at my farmer’s market in Blacksburg conjure up beautiful green heads of endive with a cream-colored center that are too tempting to pass up. Make sure the eggs have crisp edges for their smoky flavor and crunch. All that is missing is a crusty piece of bread and you are set for an easy, quick dinner. My second suggestion relies on the abundance of chickens and tomatoes at this time of year. Well, not chickens per se, but their parts. Our farmers are harvesting the last of their chicken cohorts now, so there is a good supply of necks, backs, feet, and yes, livers. It’s the livers, those firm yet squishy reddish brown shiny organs I want to explore today. 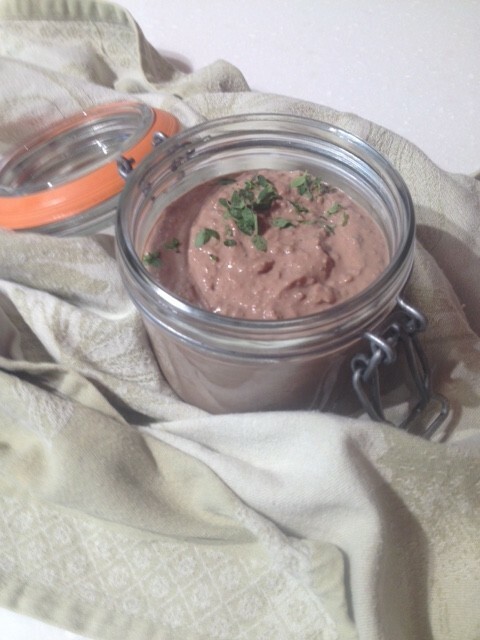 The pâté recipe below is also easy – a simple combination of shallot, liver, butter, and a small amount of port and cream. It freezes well, and is perfect on a cracker when guests show up unexpectedly, or as an earthy side dish to a dinner salad. What is maybe surprising is how well a tomato jam goes with it. It’s given in the form of a refrigerator jam below (i.e., made fresh to keep in the refrigerator for a week), but you can freeze this too. You will want to really cook the concoction down to its sticky, gooey goodness in order to transform a potential tomato sauce experience into a sweet jam, but it’s worth the wait. Here’s a quick warning about the pâté: process it for as long as it takes to give it a velvety smooth texture. The pinkish spread will look great that way. 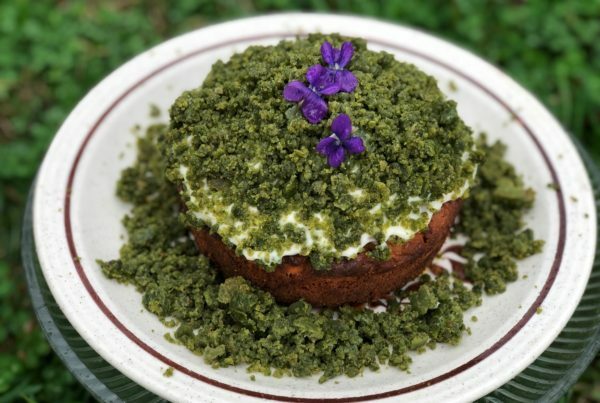 A dollop of jam, topped with a cilantro leaf will make a wonderful flourish. It’s also very rich, so a little goes a long way. Mash the garlic and pinch of salt into a paste with the side of a knife. 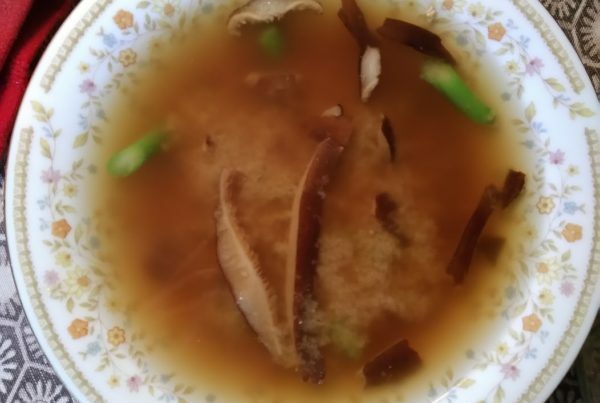 Mix it in a small bowl with the anchovy, lemon juice, and 2 tablespoons of oil. Place a large skillet over medium-high heat for 20 seconds. Add 3 tablespoons oil. 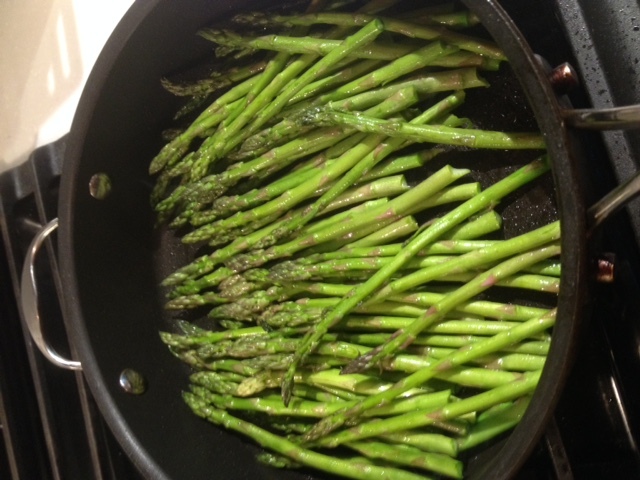 When it shimmers, add the asparagus. Toss occasionally until golden brown and almost tender, 2 to 3 minutes. Add a pinch of salt and cook until tender, 1 to 2 minutes longer. Transfer to a large bowl; add the frisée and the garlic-anchovy dressing and toss gently. Return skillet to medium heat and add the remaining 1 tablespoon oil. Crack in the eggs; season lightly with salt and pepper. Cook until the eggs are just set, about 3 minutes. Divide the salad between two serving plates. Top each with an egg. Put a large, heavy sauté pan over medium heat, and melt 4 tablespoons of the butter until it begins to foam. Add the shallots, and sauté them until translucent, being careful not to allow them to brown. 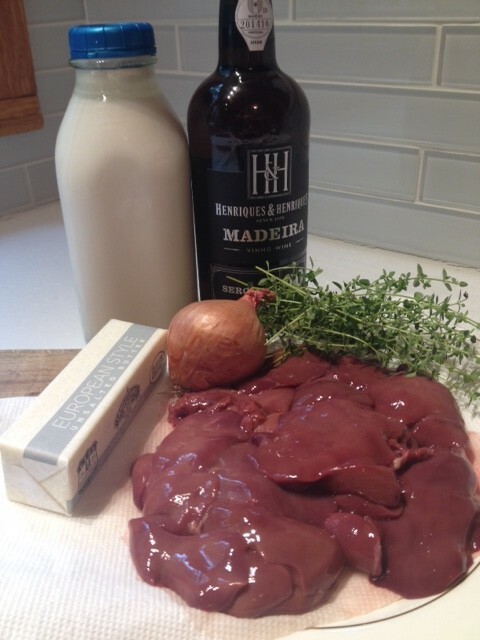 Add the liver, thyme, and Madeira or port, and bring the heat to high. 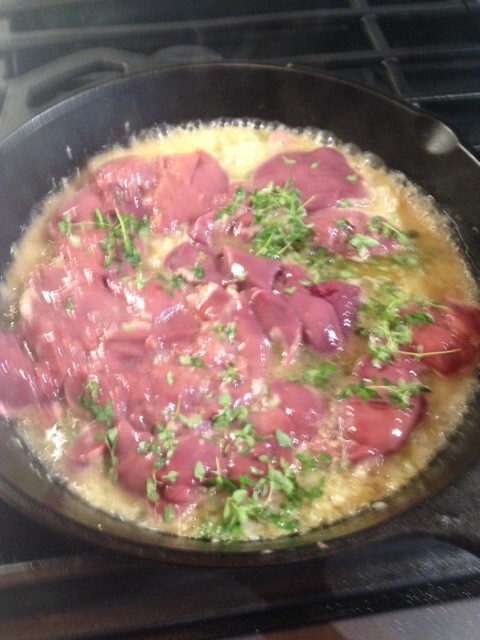 Cook, occasionally stirring the livers around in the pan with a spoon, until the wine has reduced and the livers are lightly browned but still very soft and pink on the inside, approximately 5 minutes. Remove the pan from the stove, and put its contents into a blender or food processor, along with the cream and the remaining butter. Purée until smooth, adding a little more cream if necessary. Taste and adjust seasoning, adding salt if necessary. Pack the pâté into a glass jar or bowl, then smooth the top with a spatula. Cover with plastic wrap and refrigerate until firm, about two hours or up to five days. Serve with tomato jam and copious amounts of toast. Combine all ingredients in a heavy medium saucepan. Bring to a boil over medium heat, stirring often. Reduce heat and simmer, stirring occasionally, until mixture has consistency of thick jam, about 1 hour 15 minutes. Taste and adjust seasoning, then cool and refrigerate until ready to use; this will keep at least a week.